Wednesday, June 7 — Worcester Bravehearts Baseball in Education Day, 10:30 a.m., Hanover Insurance Park at Fitton Field, 1 College St. Where was Baseball in Education Day when we were kids? Back then, we just called it Skipping School Day. Anyway, if you’re a fan of daytime baseball and gaggles of city students field-tripping away their final days before summer vacation, then this is the game for you. The Bravehearts, who began their fourth season in Worcester with a three-game homestand — and a big win on opening night — will play host to the Seacoast Mavericks, who after a bus ride from Portsmouth, New Hampshire, are probably not super psyched about Baseball in Education Day. Tickets start at $6. Thursday, June 8 — Riverdance, The 20th Anniversary World Tour, 7:30 p.m., Hanover Theatre for the Performing Arts, 2 Southbridge St. The mid-to-late ’90s was a weird time, especially in entertainment. Somehow we let bands like Chumbawamba and Third Eye Blind become chart-toppers. Smash Mouth? Come on! TV saw the beginnings of “Teletubbies,” “Oz,” “South Park” and “The View” — all in 1997. Like I said, things got weird. Then came Riverdance to the rescue. All legs and ankles and feet moving at incendiary speeds, shaking us from the ennui of our Sheryl Crow-induced slumber. And, wouldn’t you know it, just as America tests the limits of its tolerance for weird, the revered dance troupe is back again. Also at 8 p.m. Friday, 2 and 8 p.m. Saturday, and 1 and 6:30 p.m. Sunday. Tickets are $39-$74, and discounts are available for larger groups. Friday, June 9 — “Plot: Gardens of the Stories of Seeds” opening reception, 5-7 p.m., Davis Art Gallery, 44 Portland St. Running through Aug. 14, “Plot” endeavors to tell the story of a community with a heavy heart. The guest curator for Davis Art Gallery’s second 2017 exhibition, Heather Adels, died unexpectedly in March. Her work had been displayed previously in the city at the Aurora Gallery and in Pecha Kucha and Worcester Windows exhibitions. In curating this show, her work is joined by that of seven other area artists who strive to depict how “a garden and its stories — its community — connects us not only to the land but to others, our [dependence] on one another as well, a common link.” Free and open to the public. Refreshments will be served. Parking is available on-street or in the McGrath Municipal Lot. 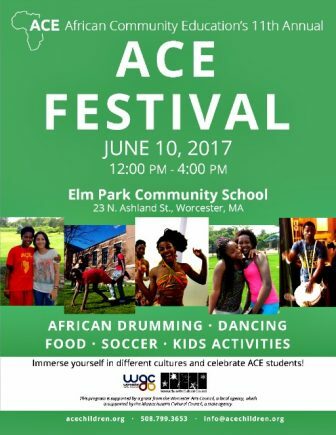 Saturday, June 10 — 11th Annual ACE Festival, noon-4 p.m., Elm Park Community School, 23 N. Ashland St. Ace is your hometown team’s best pitcher. Given the right suit, it trumps all in many a card game. It’s also the place for your helpful hardware man. But for Worcester, especially its abundance of West African refugees and immigrants, ACE — African Community Education — is even more powerful than all those combined. ACE holds an annual spring festival and other events to raise awareness and funds. Kaska Yawo, a Liberian refugee, started the program in 1998 with a group of UMass Medical students led by Olga Valdman (herself an immigrant from Russia). The program, which began as a summer project, provides tutoring and other educational support year round. 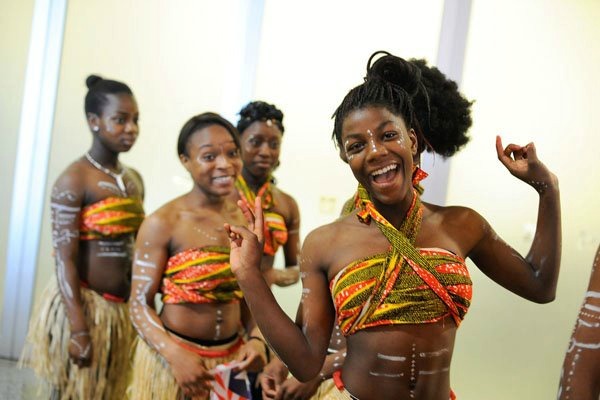 The festival will immerse you in West African culture with music, African drumming, dancing, children’s activities, food and more. Admission is free, but donations are encouraged. 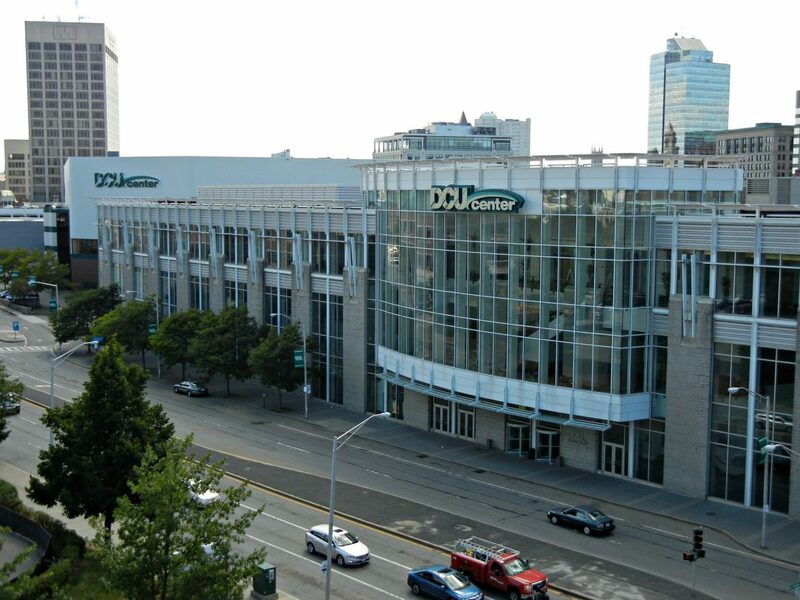 Saturday, June 10 — New England’s Future 3, 7 p.m., convention center, DCU Center, 50 Foster St. Worcester has had its fair share of sporting heroes, for sure, but it would be tough to find a modern athlete who so thoroughly resonated with every corner of the city the way Jose Antonio Rivera did on his way to a pair of WBA world championship belts (in 2003 and 2006). Well, El Gallo (The Rooster — unless you prefer Urban Dictionary’s definition) has apparently not lost his passion for the ring since his 2008 retirement. Now a fledgling promoter, Rivera — who along with his son, A.J., runs Rivera Promotions Entertainment — is bringing his third fight card to his adopted hometown, featuring top-ranked New England up-and-comer and Worcester-bred fighter Irvin Gonzalez, who is unbeaten in six career bouts. Four other city fighters are on the undercard. Tickets are $45 general admission, $75 ringside. Thursday, June 15 — A Journey to Remember: Celebrating QCC President Gail Carberry, 5:30 p.m., Mechanics Hall, 321 Main St. 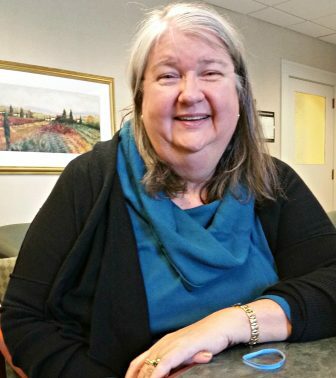 The end of this academic year marks the end of the remarkable tenure of Gail E. Carberry at the helm of Quinsigamond Community College, where she penned a rousing success story as unlikely as it is triumphant. The long-maligned school has grown in practically every way imaginable under her decade of stewardship. Now, before she hands the baton to her successor, Luis Pedraja, the dynamic education and community leader will be the center of attention at a celebration in her honor that doubles as a fundraiser for the QCC scholarship fund named after her daughter, Amy, who died in 2003. Tickets are $100.